Ace Security provides A-class close protection in London. Our close protection service is flexible and caters for a wide range of settings. Be it a red carpet event, a corporate boardroom meeting, or a family event, we can mold our close protection service to your requirements. That is how we became the #1 Close Protection company in London. Our officers have a vast experience in close protection. They have worked with people of a variety of nationalities and cultural backgrounds. 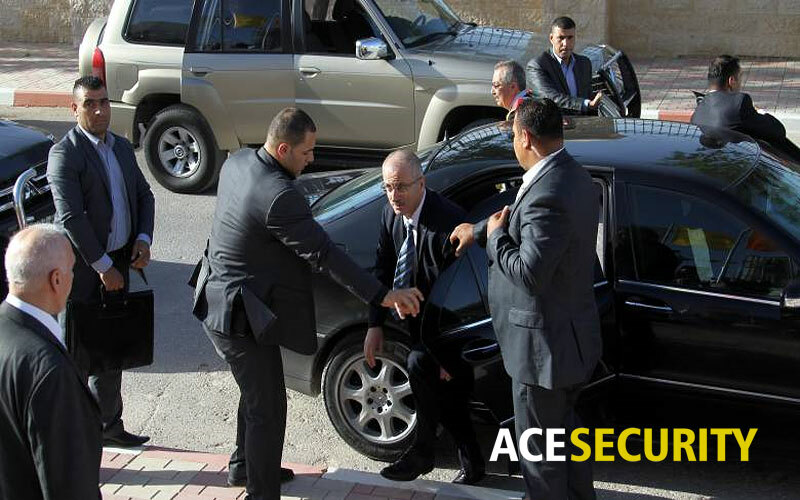 We deploy bodyguards that will make you feel comfortable around them. They will fit in with you as per your requirements. Close protection has become a necessity these days. The world is fast becoming ever more volatile. With recent terrorist incidents in London and across Europe, people are increasingly becoming security conscious. Hiring close protection guards for personal security is on the rise. All our close protection bodyguards are ex-servicemen in the British armed forces and police service. Furthermore, they are licensed by the UK’s SIA (Security Industry Authority). We make sure that our operatives are professional and second to none. They have extensive experience in both commercial and private settings. They train and work together regularly as a team which helps them polish their skills and operating procedures. This continuous training helps them provide you with top-notch personal security service. Our security staff is fully trained in unarmed combat. They are also trained in providing first aid. They don’t only carry an SIA badge but they have proper experience in providing security. They are completely fit for security-related tasks. If you want to hire close protection in London and surrounding areas, don’t look further. Ace Security is the #1 Close Protection Agency in London. Our close protection guards are well-known for professionalism. Our bodyguards have vast experience and knowledge of London city. They have received advance trained in physical defense and first aid. They can also assist you with table reservations, family trips, and day to day activities. So that you can have complete peace of mind. Furthermore, they have experience in working with high-profile individuals and high-net-worth families. Our officers will fully assist them in their fast-paced, demanding lifestyles. Besides male bodyguards, we also provide female bodyguards in London and surrounding areas. Female bodyguards are very effective in securing you due to their soft skills and overt presence. They are very helpful in family settings as women and kids feel comfortable around them. We can provide you anything from one individual bodyguard to a full close protection team. We also provide security chauffeurs, residential security teams, and mobile security patrols. Luxury armored vehicles, dog handlers, and counter-surveillance are also available upon your request. Such a comprehensive close protection will give you complete peace of mind. So that you can feel secure from the risk of any potential physical attack, be it terrorist attack or otherwise. A comprehensive security plan will also keep you safe from theft, kidnap and even murder. We understand that every person and situation is different. Each setting requires different security measures and systems to prevent potential attacks. Thus, we conduct a thorough threat and risk assessment of your specific setting. This enables us to provide a personal protection service that fits your specific needs and requirements. The first step upon hiring will be a risk assessment of your setting. Many factors are at play such as the environment being a family or business one. After a thorough assessment, we will recommend the best course of action. Our operatives will execute the security as per the specific plan made for your setting. They will make sure you are safe and secure in all circumstances. We understand that your setting might be a high risk one. Our close protection officers will protect you no matter how high the risk. Contact us today to discuss your specific close protection requirements. Click the orange button below to call us.